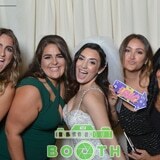 Why Hire Kiosk Photo Booth for an Event? Want to SEE what all the hype is about? Click here to view a gallery of all the fun recent customers have had in their photobooths! I hired IO for my corporate event (grand opening retail store) and we were so impressed. Fantastic pictures, the attendants got people excited and we ended up doing lots of social media sharing! I used Inside Out for my daughter's Sweet 16 and we could not have been more impressed! They were so easy to work with, even with my daughter's specific ideas and requests...they over delivered!